Pre-construction to be built. 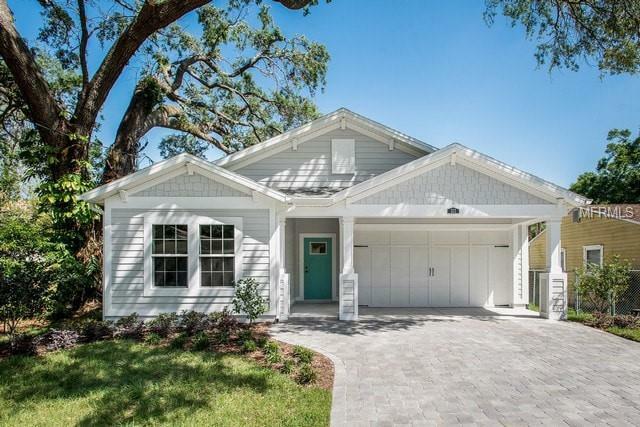 K & M Estates located in Seminole Heights will feature five of Gulf Bay Builder's most popular homes. This spacious "Magnolia with Den" model boasts 4 bedrooms, 2 baths, 2 car garage. (Option to make the 4th bedroom a den/office or enlarge the family room). As you walk into this energy efficient home from your foyer, you will see the secondary bedrooms are in the front with a guest bathroom in between. Next, is the kitchen opening into the living/dining room combo. The gourmet kitchen with its breakfast island has plenty of space for the collaborative cooking adventures. Standard kitchen features include granite or quartz countertops, 42" wood cabinets, decorative subway tile backsplash, stainless steel sink with a "Moen" faucet, walk in pantry, and Energy Star GE appliances. The master suite is located in the back of the home. The master bath features a double vanity with granite countertops, luxury shower with bench. As you walk throughout the home, you will see other standard features throughout the home including; "COREtec" flooring, 5 1/4 inch baseboards, 3 inch casing and trim around windows and doors, and recessed lighting. Gulf Bay Builders energy efficient features include; Lennox air conditioner, Structural insulated panel wall system, Spray foam insulation over living areas and in attic, Jeld-Wen Hurricane impact windows, anti-allergen air filters, TechPure air cleaner, energy efficient water heater, & Florida Friendly Landscape.